Obtaining an undergraduate or advanced degree is an investment in your future. We know that it is a difficult process to understand, so we’ve listed some general tips here. Already know the basics? Learn about the aid process at Drew. Jumpstart your financial wellness by going here. You will learn about financial basics, how to finance a college education, how to plan for retirement, and major life transactions. This program will help you understand key financial concepts and make better decisions related to managing your money. It will help you understand the costs associated with financing an education and navigate the application and repayment process. It will help you plan today for the life you want in retirement. Explore important financial planning topics like investment strategies, estate planning, and social security so you can have a comfortable retirement. This program will equip you to better manage some major financial decisions that may come your way. Certain things about college costs are generally true: tuitions of independent colleges are higher than those of public colleges; tuitions of public colleges are less for in-state than for out-of-state students; and community colleges cost the least of all. Yet for specific students, none of the above may be true. Financial assistance makes the difference. Before you let preconceived ideas of cost make a college decision for you, take the time to learn the real bottom line about any college you consider. As you develop a “short list” of colleges that you might like to attend, make a list of costs for each one, and don’t eliminate any based on cost. The colleges’ own publications and admissions offices readily provide this information. Make sure to obtain the most current figures. In addition to tuition, fees, room, and board, don’t forget to estimate the cost of books, living, and travel expenses, and the occasional movie, concert, or other treat. Remember that all the costs tend to go up a bit each year, so take that into account as you plan for four years of college. Planning for college requires family teamwork. After all, it’s a major investment for the entire family. It might be helpful to look at this whole undertaking from your parents’ point of view. In a way, the cost of college for them is like the cost of financing a new car every year for four years. It may be awkward to talk with your parents about money matters, especially if you haven’t participated in family financial decisions before. But now is the time to become involved, because preparing for college includes taking on new responsibilities. You and your parents should assess how much money is available for your college tuition and expenses. This would include savings, employment earnings, investments, and other assets – your own and those of your family. If the college of your dreams still costs more than your family has to spend, don’t give up hope! Financial assistance puts college within reach for thousands of students every year. Numerous programs exist to help motivated, qualified students get a college education. Federal and state governments offer grants (outright gifts of money that need not be repaid), low-interest loans, and part-time employment programs, including the Federal College Work-Study Program. Colleges and universities also award their own grants and scholarships (grants awarded for academic or other talents). In addition, religious and civic organizations, local businesses, and other private groups sponsor a wide variety of grants and scholarships to deserving students who meet specific criteria. Make an appointment to discuss scholarship and loan programs with your high school guidance counselor. Contact the financial assistance officers at the colleges in which you are interested to find out what programs they offer. If your state has a grant program, call a representative of the appropriate state agency. To find out even more, head to your school or public library and ask the reference librarian to show you the books and directories that list financial aid programs. There is also a lot of information about financial aid available on the Internet. We suggest you start with the following websites: finaid.org and collegeboard.com. Be sure to find out how and when to apply for each assistance program and to call or write to obtain all required application forms. A little research and effort on your part can yield a lot of savings. Even though you may not think you qualify for financial assistance, the facts may surprise you. 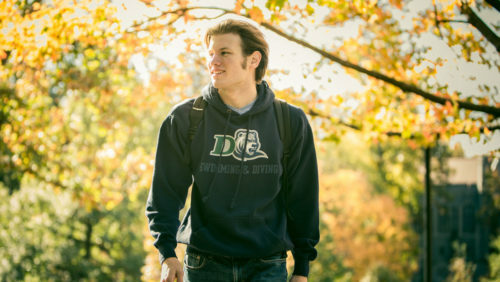 Last year at Drew, for instance, over 80 percent of all students in the College received some form of financial assistance. Make your financial circumstances known. Get to know your financial assistance officer(s). They will work with you to be certain you are applying for all forms of aid for which you may be eligible. Remember, if a college admits you, it’s because it wants you to enroll. The financial assistance and admissions officers will try to make it possible for you to attend. You may be able to obtain enough financial assistance to meet all or most of your financial need. If so, a high-cost college may not be much more expensive than one with lower costs. This frees you to choose a college based on quality rather than cost. Even if you don’t qualify for assistance, or are not awarded enough aid to meet your need fully, you have other financing options. Education loans are available from local banks and other lending institutions. Tuition payment plans, offered by some colleges and by financial institutions, let you pay your yearly expenses in smaller monthly installments that can be more easily incorporated into the family budget. Part-time jobs are often available on or off campus. In addition some scholarships are awarded without regard to financial need to students who demonstrate notable academic ability or other talents. To receive need-based financial assistance, you need to apply for it by the stated deadlines. You should set up an application calendar, circling deadline dates well in advance to remind yourself of each one. Allow plenty of time to fill out each form. Missing even one deadline may mean missing out on significant financial assistance. You and your family should fill out the applications together, if that is possible. Your parents will have to provide specific financial data and sign the forms where required, but you are the only one who will really benefit by being involved from start to finish in this process (and who will probably have to pay back the loans after graduation!). Some families who have more complex financial situations find it helpful to include their accountants or tax consultants in the completion of the forms, although most families can complete the process by themselves. Most financial assistance is based on an assessment of your financial need. Need is the difference between your educational expenses—tuition, fees, room and board, textbook costs, and personal expenses—and what your family can reasonably be expected to pay toward those expenses from income and assets as well as from your own earnings and savings. Many factors in addition to income are considered in determining financial need: assets of both the student and parents, debts, number of brothers and sisters in college, other family educational expenses, and parents’ retirement needs. If a student’s need for assistance changes from one year to the next, his/her financial aid may change. The Free Application for Federal Student Aid (FAFSA) determines your eligibility for federal and state funds. Institutional parameters, such as home equity, are added to the federal calculation to determine eligibility for Drew funds. Other adjustments may be made on a case-by-case basis to determine an amount that represents the family’s ability to pay. Learn more about applying for financial aid at Drew. Generally, scholarships are applied toward tuition only. Due to federal legislation passed in 1986, all grant and scholarship awards that total more than the cost of tuition, related fees, books, and educational supplies are subject to U.S. tax. Consult your tax adviser if you have any questions. A student must maintain Satisfactory Academic Progress (SAP) toward the degree overall and on performance every year to continue in good standing. Learn more about SAP and other academic requirements.